Additional GIS Data – Additional GIS data, maps and applications can be discovered at the Public Works Department, Utility Department and the Property Appraiser's Office websites. Welcome! The Geographic Information Systems (GIS) Division is responsible for the creation, collection and management of location-based information pertaining to St. Johns County, Florida. 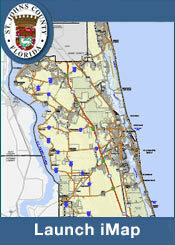 Examples of this geographically-referenced information that are maintained by the GIS Division include: Commissioner Districts, School locations, Road Centerlines, Address Site points, Fire and EMS Zones, Beach Access Points, Digital Orthophotography, and Municipal Boundaries. From this information, the GIS Division is able to generate customized maps, perform complex analyses and develop applications that allow the end user to make better informed decisions. For additional information regarding GIS, please visit www.gis.com. The GIS Data are available for download from our Data Depot and maps are available for viewing and downloading from Map Mart. Links to the mapping applications can be found in the Interactive Tools Section located on the right of this.